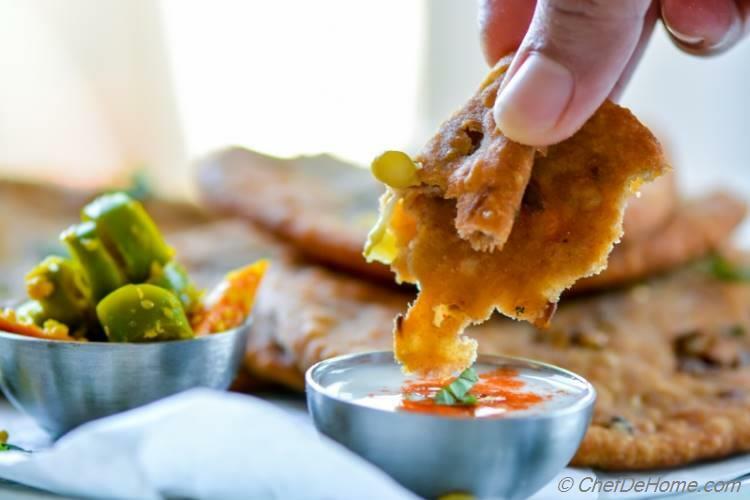 Khasta (crispy) Masala (spices) Poori stuffed with sprouts and fried for golden crispy texture.... this fried poori/puri is cross between Indian traditional poori and masala khasta kachori. 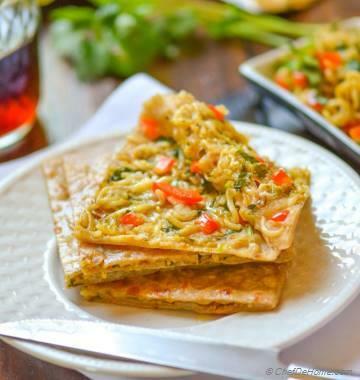 This is by-far the most delicious way to use leftover sprouts in my home. Before I dig any deeper into crispy layers of this poori, I must tell you I'm a sprout fanatic. I think I have shared with you before that I always have a small bowl of lentils/legumes sprouting on a corner of my kitchen counter. I pack handful every morning for snacking for Vishal. That reminds me, Karwa Chauth is here girls! For those who don't know, Karwa Chauth is religious fast that Indian married girls keep for their husband's long life. It is one day fast with eating only before sunrise and after moon rise. 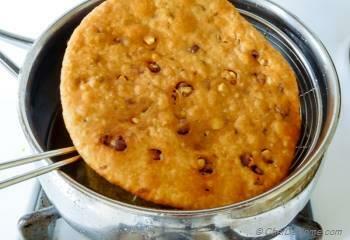 It feels like yesterday when on last Karwa Chauth I shared Methi Mathri with you. Can't believe this year too I'm sharing similar recipe. I guess, I naturally felt like to share a traditional recipe for approaching festive season. 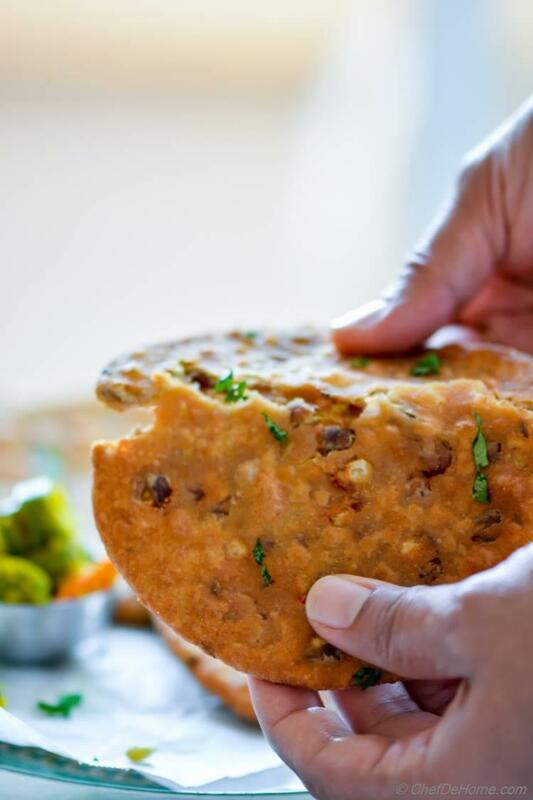 Just like Mathri, this masala poori is excellent for opening Karwa Chauth Fast.. You can even skip the sprouts and serve it with spicy potato curry on side. yumm! PS: If plan to make these poories, don't forget to serve cooling raita and Indian pickle for a traditional festive Indian Breakfast. Back to my sprouts business :) So I'm always hunting for new ways to use sprouts and have posted few recipes too. Last weekend in Book Store I came across this awsome book by Indian Chef Ravi and my eyes first spotted a sprouts stuffed poori. Loved the idea!! I'm not a huge poori (puri) or kachori person. Mostly, make pooris during festivals. Where I have eaten very less poori and kachories in my whole life.... Vishal has grown on it! So obviously he adore a khasta poori breakfast any given day! Last weekend, I opened the book and started making the recipe. Often I love adding my spin to other's recipe but this one looked so simple and just perfect. So I have made it as-is. Measurement of ingredients are per my taste and liking rest procedure is all adapted from book. Poori were ready very quick. I served them with some raita and mirch ka acchar (chili pickle). Forget sprouts, even crust was delicious on it's own. I know! Don't judge me on this one. I told you, I have not made a lot kachori or poori in my life. Just started after marriage. :) So learning from experts and sharing the secrets with you too. Sounds good, right? 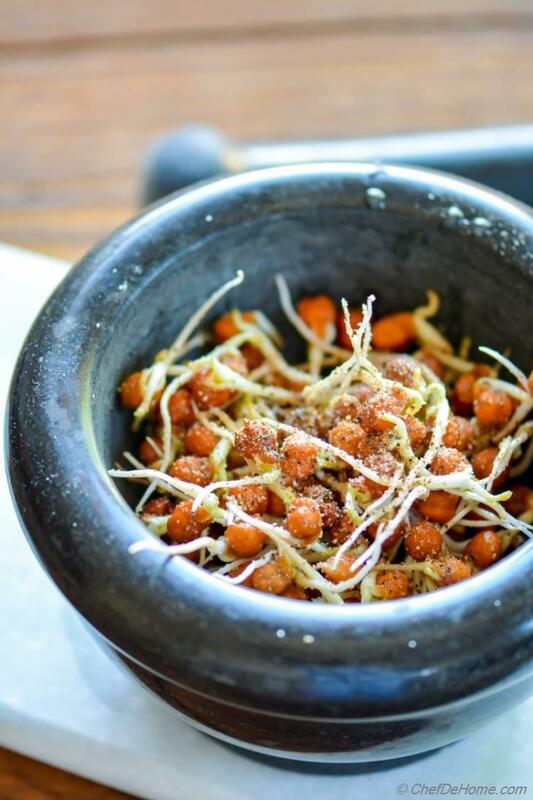 For sprouts, I mostly have mung or black chickpeas (garbanzo) in home. You can use any sprouts of your choice. Just don't use very young sprouts that are hard in texture. or shallow fry and cool them before filling in poori. I hope you all enjoy the recipe as much as did. Wish you all Happy Karwa Chauth (in advance). 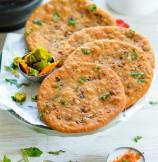 Total Time 35 minutes Prep Time 15 minutes Cook Time 20 minutes Difficulty Easy Yields 8 Poori Serves 4 Notes No. of servings depends on serving size. Smart Swap Use any sprouts as per availability. 1. 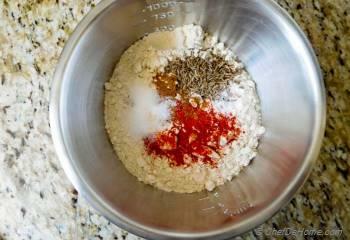 In a bowl, take flour, paprika, salt, garam masala, 1 tablespoon oil, and cumin seeds. 2. 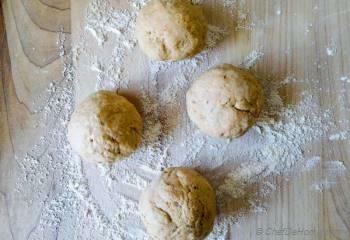 Add little water at a time until dough comes together. 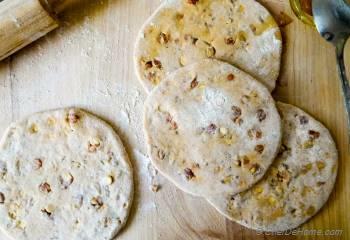 Dough should not be dry yet not very soft. 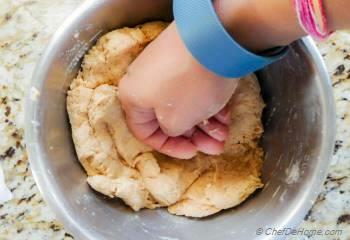 Knead the dough with hand for 1 minute, cover and set aside. 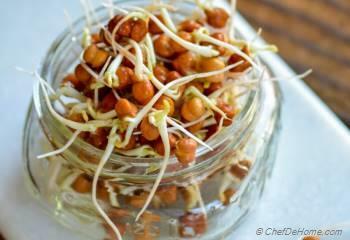 3. add pinch of salt and black pepper on sprouts and chop coarsly or use food processor to rough chop tem. you can also use mortar-pestle like I did. 4. 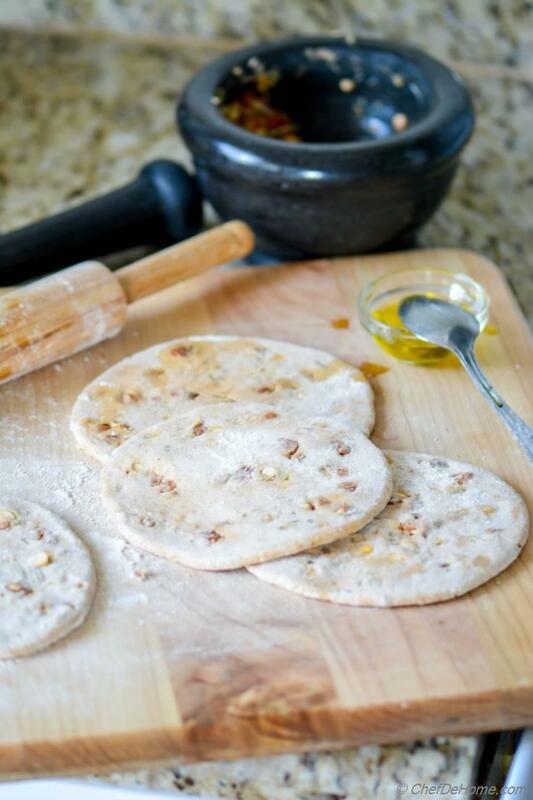 Divide dough into 8 equal parts. Put oil for heating while you prepare poories. 5. Roll each into 2 inch circle. Spread some oil. 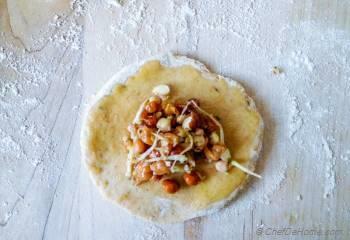 Place a tablespoon or 2 of sprouts mixture and fold all corners inside to make round stuffed ball. 6. 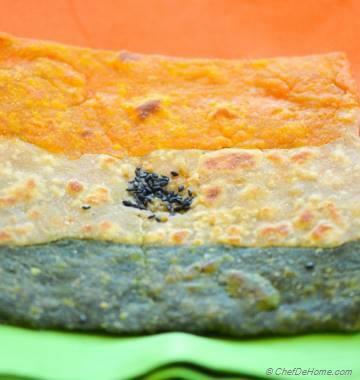 Roll each stuffed poori to 3-4 inch circle. 7. 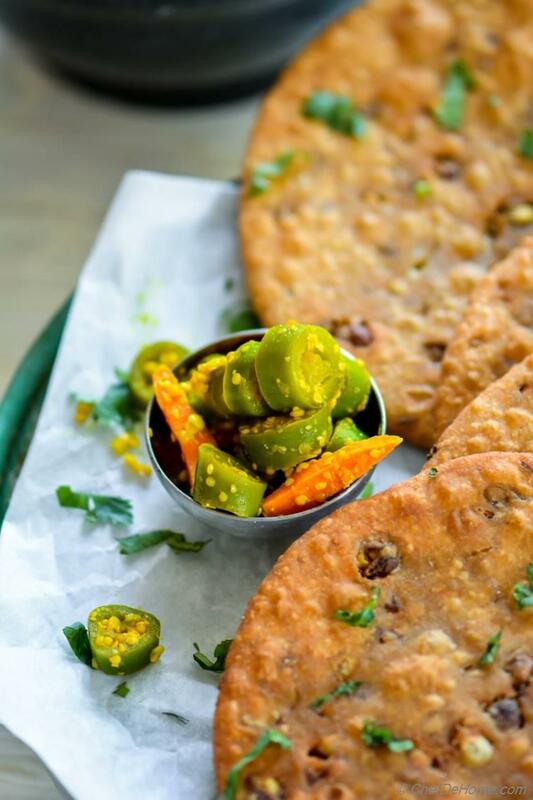 Deep fry poori 3-4 minutes until crispy and brown from both sides. Remove on plate lined with paper towel, repeat to fry all poories. 8. 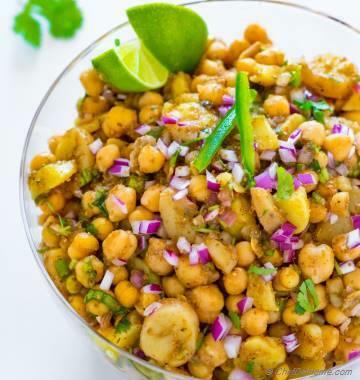 Serve warm with Indian Raita and Chili pickle. 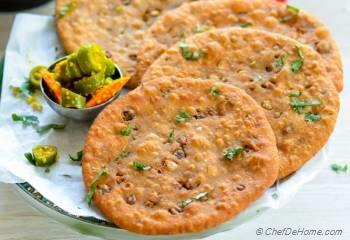 These masala poori looks crispy and nice. thanks, Manali! Same to you! With the festival season, this is exactly the kind of thing I crave! Delicious! Bach, thanks! 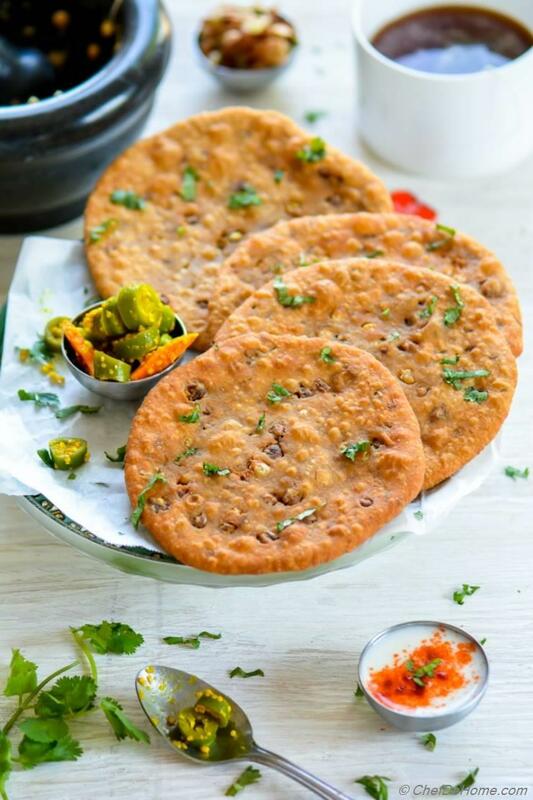 Poori are meant to enjoy in festivals! Isn't it?